How do you reinforce the chassis after cutting the roof off? Most people reinforce the chassis BEFORE cutting the roof off. Othewise, the chassis "sags" in the middle and you'll have to do some pretty fancy math to get everything back up to spec again. Anyway, what is the common practice is to make TWO distinct support systems. 1 - Frame in the underside of the chassis. First, make a solid 2X2 square tube "box" around the tub portion of the chassis. Along both sides, across the back beneath the firewall and across the front behind the front wheels. Wled this directly to the existing frame and right up to the edge of the sides of the frame. You'll be attaching something to it in step three. 2 - Fill in this new "box frame" with an "X" that goes from front left to rear right and of course, the opposite. 3 - Using PLATE steel, run a 1/4 x 3 inch (or more if you want) along the rockers from the front wheels to the firewall in the rear. The bottome edge, weld along the top edge of the "box frame" you welded in step 1. 4 - Weld another sheet steel plate from the "junction" at the firewall (where the "box frame" turns in and across the bottom of the chassis) to the top of the firewall. Weld the base of this new plate onto the rocker plate as well. 5 - Reinforce the connection of the two steel plates with another small steel plate welded directly to the top of the seam. Now, cut the roof out. The chassis should not flex at all. definitely re-enforce first. I did NOT and have had problems. Not sag but bending/bowing at the firewall junction as it is on jack stands and there is all that weight (v8) hanging back there. you definitely need some kind of support to keep the firewall from bending toward the rear. step 4 of DKOV. I actually put another 2x2 at an angle from my box frame(rear is wider to go past rockers) up to the upper rail. What was I thinking??! !&nbsp; I could have a VR4 Spyder for this kind of money. This is what was done on the LA Machine convertibles. There are a few more pics in the manual that may be helpful. I recently bought a convertible (an 87 coupe originally) which was converted when new. 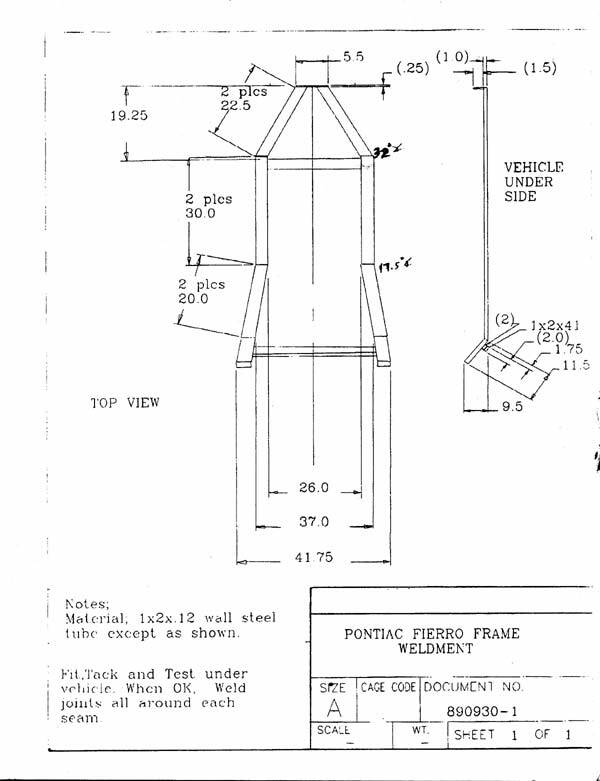 The frame reinforcement is made of box steel about 2" by 3" connecting the front and rear subframes together. There are additional reinforcments under the carpet which I have not yet looked at but I am told these are 3/8" plate steel. The configuration of the reinforcements looks similar to the diagram for the LA Conversion described earlier. The sub frame connectors are welded to the floor pan and front and rear sub frames as well as being bolted to the reinforcements under the carpet. Does anyone have any plans drawn up for this method? John has had my car and was working on getting exact measurement of the subframing. He should have them by now. Last time we talked he was thinking of making up few frames. Call him and he can either supply you with a subframe or will supply you with the specs. Looks simular to the drawing but John will be able to supply more details. I know he was working on the top also. I have been out of town and out of touch. Will call him Sunday and find out about his progress on the top. Hope to be able to pick up the my kit in the next couple of weeks and have done in a month. Will post pictures as we go. Both my son and I will be back middle of next week will try and duplicate the vedio also. For Sale Chassis works chassis parts. Everything needed to build the chassis. Chassis Works are they any good? and other chassis plans?